A GW scientist is part of the first mission in history to study the surface of a comet. The surface of comet 67P/Churyumov-Gerasimenko is rife with nitrogen-bearing materials that likely contributed to the origins of life on Earth, according to a paper co-authored by a George Washington University research professor. The data—collected from the Philae space lander—support the theory that comets and other small bodies bombarded our planet billions of years ago, bringing with them organic compounds that later may have evolved into living matter. Philae is part of the European Space Agency’s ambitious Rosetta mission. It touched down on comet 67P in November 2014 and gathered data from its surface for 60 hours, until the lander’s batteries ran out of power. Now, a series of articles, published Thursday in a special issue of Science, presents the fullest picture to date of the comet’s composition, structure and interior. Pascale Ehrenfreund, a researcher in the Elliott School of International Affairs and chair of the German Aerospace Center, studied the comet’s organic compounds with collaborators from around the world. The Philae space probe used a gas chromograph and a mass spectrometer to “sniff” for molecules during its bouncy landing in the fall. Dr. Ehrenfreund and her colleagues then spent months analyzing the data to identify its chemical makeup. They concluded that the comet contains at least 16 organic compounds, four of which—methyl isocyanate, acetone, propionaldehyde and acetamide—have never been detected on a comet before. 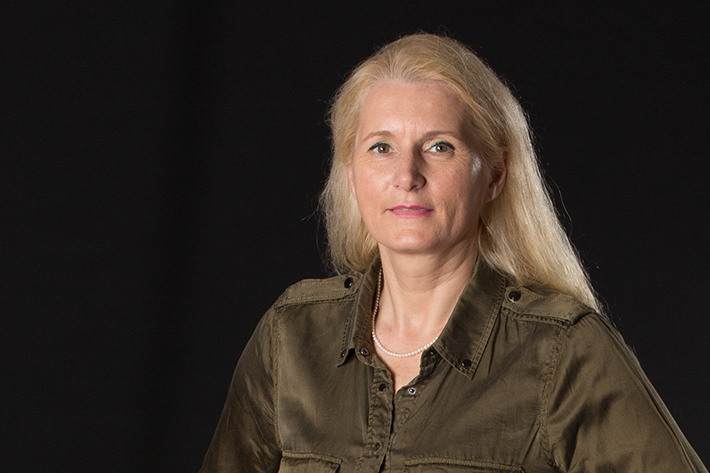 Pascale Ehrenfreund, a research professor in the Elliott School of International Affairs, is involved with measuring the chemical composition of comet 67P. Our solar system formed about 4.6 billion years ago when an interstellar cloud collapsed, giving birth to our sun and planets. The leftover material that was not incorporated into planets—comets and asteroids—are cosmic time capsules. Unlike our Earth, which has been subjected to weathering and erosion over time, comets harbor “the most pristine material” in our solar system, Dr. Ehrenfreund said. “They live very, very far on the outskirts of our solar system and beyond and contain material that is very original,” she said. Beyond their significance as ancient relics, analyzing comets could provide clues to the beginnings of life on Earth. Scientists have long hypothesized about how life on our planets came to be. Researchers like Dr. Ehrenfreund believe that, during the first 700 million years of young Earth’s life, balls of rocks and ice blasted the planet. The comets, they speculate, transported with them molecules that eventually formed the building blocks of life. The data from Philae shows that comet 67P contains a mixture of molecules that support this origin theory, contributing knowledge not only about the formation of our own solar system, but also about the evolution of others. “The complexity of cometary nucleus chemistry and the importance of nitrogen-containing organics imply that early solar system chemistry fosters the formation of prebiotic material in noticeable concentrations,” the researchers conclude in their paper. Philae awakened from hibernation in June after a seven-month slumber, but communication with the spacecraft has been intermittent. On Aug. 13, the comet will make its closest approach to the sun, which will put it also in a good position to get in contact with the lander again. Dr. Ehrenfreund said her team is just at the beginning stages of understanding comet 67P and its impact on how we understand Earth and the outer space that surrounds it. Their next steps will be to piece together data from the multiple instruments analyzing the comet, in order to get an understanding about the origin and evolution of this interesting solar system object. “Scientists will be busy for years as they combine the data of the Rosetta mission to try and understand this comet,” she said.